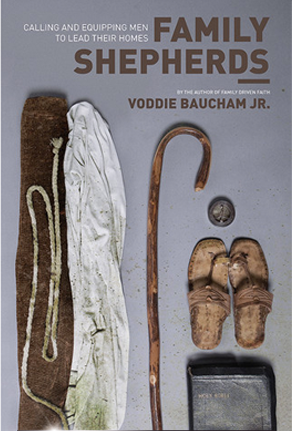 Voddie T. Baucham Jr. Family Shepherds: Calling and Equipping Men to Lead Their Homes. Wheaton: Crossway, 2011. 192 pp. $15.99. Until a few years ago, Voddie T. Baucham Jr. was known primarily as a cultural apologist and popular speaker at youth events. Much of that shifted in 2007 with the publication of Family Driven Faith: Doing What It Takes to Raise Sons and Daughters Who Walk with God. With Family Driven Faith, Baucham’s name became associated with a growing family ministry movement. Most of this attention was positive, recognizing his strong call for intentional family discipleship. Other responses were more critical, choosing to focus almost exclusively on the viability of family-integrated ministry—despite the fact that only one chapter in the book even raised the issue of family-integrated churches, and Baucham explicitly stated that he didn’t intend this model to serve as a blueprint for every church (Family Driven Faith, 213). In Family Shepherds: Calling and Equipping Men to Lead Their Homes, Baucham brings together his passion for family discipleship with his earlier emphasis on developing a gospel-centered worldview. He presents family as a primary context for worldview formation (“family is the cornerstone of society,” 11) and then identifies the father as primarily responsible for cultivating gospel-centeredness in his family. Baucham does not propose in this book to promote any particular paradigm for family ministry. He briefly mentions family-integrated ministry in the book’s opening pages, sets the issue aside, and plows forward without looking back (12-13). He aims to present “transcendent truths that govern Christian fatherhood” with the goal of preparing Christian men for their God-ordained responsibility to lead families (11, 13). Particularly in the first chapter, Baucham draws heavily from Old Testament precepts as he develops biblical foundations for family discipleship. He brushes aside any concerns related to this approach by attributing such concerns to a “dispensational” bent or to an overemphasis on “discontinuity between Old and New Covenants” (20). To be fair, Baucham has done the necessary exegetical work to develop a hermeneutically sound framework for his use of the Old Testament in almost every instance. Still, in a work that includes so many references to the Old Testament, it might have been helpful to include a paragraph or two to help laypeople to understand how and why his applications of Old Covenant texts to New Covenant realities are warranted. The second chapter of Family Shepherds develops a “three-pronged” approach to family discipleship through exegesis of Paul’s letter to Titus, while chapter three compares the biblical expectations with the lifestyle of a fictitious “typical churchgoing” family (39). Chapter four, “Heralding the Gospel at Home,” is Baucham at his best. This chapter serves as a launching pad for the remainder of the book and grounds the husband’s priestly and prophetic roles in the gospel. (The chapter also includes a true story from a family trip that involves a bidet. Any time you can include a bidet in a book for the church market, you know it’s been a good writing day.) Baucham explains what the gospel is not before proceeding to define what the gospel is (55), then explains what the gospel requires and produces (59). His understanding of the gospel as eschatological becomes the foundation for seeing the family as a God-ordained means (rather than an end in itself) and for showing patience and grace toward one’s wife and children. The next two chapters demonstrate that catechesis (63) and family worship (73) are effective means for the communication of the gospel in families. Baucham emphasizes the “primacy” of marriage among human relationships (91). According to Baucham, the husband’s career relationships exist to serve his family, not the other way around. Children are the fruit of the marriage relationship, not the foundation. Baucham’s point of prioritizing marriage (97) strengthens his previous assertion that the goal is not merely to develop a healthy family but to rehearse the gospel together as a family (13). As a living picture of Christ’s relationship with the church, marriage must take precedence over careers and children (98). When children see a husband love his wife as Christ loved the church, they see the gospel lived out in flesh and blood. Baucham’s final words on male headship in the home are brief and straightforward (101), providing a substantive primer on navigating secular and Christian feminism. It did seem that one additional question might have been addressed in this section: How specifically should husbands disciple their wives? Baucham rightly declares that a husband must prioritize his wife. Yet beyond leading in catechesis and family worship (which seem to focus more on the man’s children than on his wife), how does a husband lead his wife spiritually? I suspect that most men have no idea how to answer that question. A handful of practical suggestions might have strengthened this section. Baucham draws a clear contrast between a biblical perspective on parenting and behaviorist approaches. To illustrate this contrast, he broadens the definition of Pelagianism to include a range of contemporary perspectives that treat children’s nature as neutral rather than corrupted (115-117). To exemplify parental Pelagianism in action, Baucham appeals to a self-published book by Michael and Debi Pearl, To Train Up a Child. Baucham seems to assume that his readers will immediately recognize this book (117-118), though neither of us is aware of the Pearls’ materials being used outside a few family-integrated congregations. Perhaps it would have been helpful to address a better-known book on Christian parenting—and there are many from which to choose!—that exemplifies a Pelagian approach. That said, Baucham’s central point regarding contemporary Pelagianism is presented clearly and memorably. Baucham helpfully distinguishes between formative discipline andcorrective discipline. The chapter on formative discipline summarizes and paraphrases Cotton Mather’s A Family Well Ordered for contemporary audiences—this summation, in itself, provides a welcome tool for pastors and parents. The chapter on corrective discipline presents corporal punishment as “necessary,” appealing to texts from Proverbs as if they are prescriptive commands rather than inspired observations regarding typical patterns of wise living (140-141). Spanking certainly stands within the range of appropriate responses for Christian parents; however, it seems that presenting corporal punishment as necessary may be pressing the proverbial texts too far. For some children—particularly if they have been adopted from abusive backgrounds—corporal punishment can be counterproductive. The last section of Family Shepherds urges men to re-evaluate their lifestyles and includes clear recommendations regarding church membership, time use, and culture shaping. Less effective is the final word on “fatherless families” (173). Ministering to single-parent families is a struggle in almost every church, especially when those single parents are mothers. Yet the recommendations for how family shepherds can serve these single-parent families seem vague compared with the rest of the book. And what about children who come to church with no parents at all? How should family shepherds minister to them? All such questions aside, Family Shepherds is highly recommended for use in men’s groups, one-on-one mentoring, and premarital counseling. Equipping and mobilizing men is a necessary foundation for cultivating gospel-centered families. Far too many men’s ministry resources have relied on surface-level solutions instead of showing men what it looks like to guide their wives and children as Christ-imitating servant-leaders. This text centers equipping in the gospel and demonstrates how this functions in the home and church. W. Ryan Steenburg (PhD, The Southern Baptist Theological Seminary) is the founder and director of Daddy Discipleship and serves as the associate pastor of the Christian home at First Baptist Church in Prospect, Kentucky. Ryan lives in Louisville with his wife, Kristen; son, Wes; and daughters, Caitlyn, Anabelle, and Mikayla. Timothy Paul Jones (PhD, The Southern Baptist Theological Seminary) is associate professor of leadership and family ministry at The Southern Baptist Theological Seminary. He is the author of more than a dozen books and serves in the SojournKids ministry at Sojourn Community Church. He lives in St. Matthews, Kentucky, with his wife, Rayann, and daughters, Hannah and Skylar. For more information about Timothy, visithttp://www.timothypauljones.com.